The brand new 2016 DS4 has received a facelift with improvements to the styling and equipment along with more options and a new 208bhp turbocharged engine. Back in 2014 the DS brand started to make a bid for freedom from Citroen and in recent years it has given us an array of exceptional premium cars. 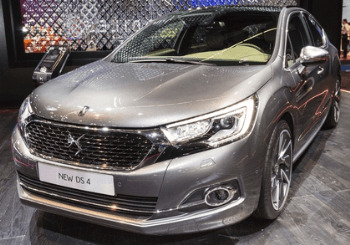 The separation of the brands provides DS Automobiles a clear target and vision for the premium sector, in this case putting clear space between the C4 and DS4. Major changes to the outside of the DS4 include a new front bumper and grille which has been refined to signify the separation from the C4. Around the wide front grille is a nicely shaped outline in a shiny chrome finish matching the eye-catching DS badge. There are also chrome lines adding definition around the bottom of the doors, front bumper and rear bumper which has the two exhausts built-in. You’ll find premium styling inside the new DS4 including plush leather seats and a neatly trimmed dashboard with a tidy centre console, all sporting chrome outlines. Matching material colours are seen throughout the cabin. The Prestige trim comes with a range of useful technology including satellite navigation and media system built into a 7” touchscreen, Bluetooth, dual-zone climate, DAB radio and cruise control. Named the 210 THP, this 1.6-litre turbocharged petrol engine puts out 208bhp and 210lbft of torque providing very pleasant performance, paired with a six-speed manual gearbox. The new DS4 is the 210 THP engine’s first appearance and is designed to make the car fun and comfortable to drive, pulling strongly in any gear. The ride has been improved with developments in the suspension combined with lowered ride height which leads to better handling; the car feels more composed on the road. You’ll have confidence taking a corner with the DS4's precision steering and improved brakes that have great stopping power but don’t grab aggressively when you touch the pedal. Expect to see the new Citroen DS4 on sale soon at your local Howards Taunton and Weston-super-Mare dealerships. There is also going to be a crossover model available called the DS4 Crossback.